Home > CULTURE > Japanese Onomatopoeia: How Many Words Do You Know? Like in English, Japan has its own onomatopoeia called giongo (擬音語). Words, which phonetically imitate the sound that they describe, are not rare things. In Japanese though, the range and variety is so wide, that onomatopoeia is even divided in two categories, giongo (擬音語)) and gitaigo (擬態語). Whereas giongo is mainly describing sounds of things, gitaigo is describing behaviour and atmosphere. This might sound a bit difficult to imagine, particularly when it comes to the sound of silence. The sound of silence? What sound does silence make? Doesn’t silence actually mean “no sound”? It can get very philosophical here. Other difficult to imagine “sounds” would be the sound of happiness, sadness, excitement, anger…. how can emotions make a sound? When someone is happy or sad one might still imagine the sound of laughter or sobbing. But what you say, when you hear that Japanese has a way to describe the sound of impatience, weakness, shininess? These would be of course more words, that describe the emotion or situation, rather than the sound these actions make. Like in English, when someone says “tic toc, tic toc”, you would immediately associate a clock or a time bomb, the same goes for Japanese onomatopoeia. People do not need to say the actual item, or go into details when describing a situation. One onomatopoeia is worth a thousand words! 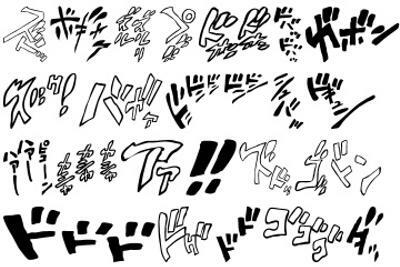 Finally, Japanese onomatopoeia might sound rather confusing and a challenge, but once you start to get a feeling and understand their meaning, you can jazz up your vocabulary and get much more proficient in the Japanese language! Try to compare and find analogies when getting to know words. It is advised to learn these sounds in groups, i.e. group of animal sounds, emotion, eating/drinking sounds, weather sound, etc. Are you familiar with Japanese Häagen-Dazs flavors?